Ovarian clear cell carcinoma (OCCC) is the second most common ovarian cancer after serous carcinoma in Japan. OCCC has a more unfavorable clinical outcome due to a poor response to platinum-based chemotherapy, compared with serous carcinoma. Hypoxia inducible factor-1α (HIF-1α) is a key regulator of cellular response to hypoxia and plays an important role in tumor growth, and HIF-1α gene single-nucleotide polymorphisms (SNPs) adversely affect the outcome in some cancers. Herein, we investigated the association of the HIF-1α gene SPNs with clinical outcome in OCCCs. Eighty-nine patients with OCCC were recruited in whom pathological diagnosis was confirmed with surgically resected specimen. The SNPs of C1772T and G1790A in the HIF-1α gene occurred in 23.6 and 3.3% of the patients, respectively. 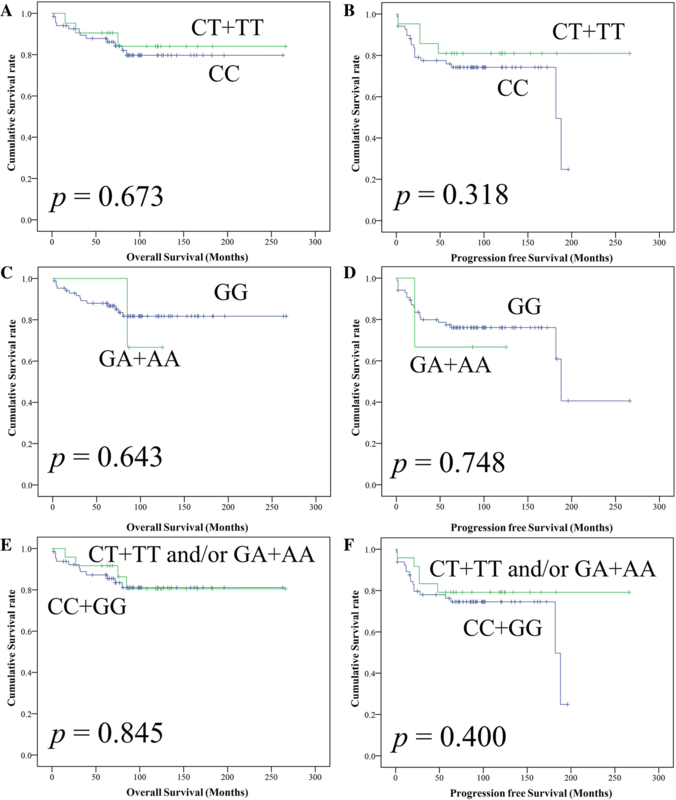 In the univariate analysis, overall survival was associated with stage and surgical residual tumor but not with the SNPs C1772T, G1790A, C1772T and/or G1790A. In the multivariate survival analysis, a significant association was observed between outcome and FIGO stage and/or surgical residual tumor; however, no association was obtained between HIF-1α gene SNPs and these factors. In conclusion, unlike the other cancers in which HIF-1α gene SNPs were demonstrated to be associated with the outcome, OCCC prognosis may not be affected by HIF-1α gene SNPs. Further studies need to be performed to clarify the association of HIF-1α expression with the unfavorable prognosis in OCCCs, in terms of transcriptional/translational activity, nuclear translocation of the protein, and protein degradation. Ovarian cancer is the leading cause of death among gynecological malignancies, as well as is the fourth most common malignancy in women in developed countries, following breast, lung, and colorectal cancer [1, 2]. Each of the ovarian cancers, represented by serous carcinoma, endometrioid carcinoma, clear cell carcinoma, and mucinous carcinoma, are known to have specific clinicopathological features and molecular or genetic characteristics. In Japan, ovarian clear cell carcinoma (OCCC) is the second most common ovarian cancer, following serous carcinoma [3, 4]. OCCC arises from endometriosis in 50–70% of the cases [5, 6] and has a more unfavorable prognosis due to a poor response to platinum-based chemotherapy, compared with serous carcinoma [3, 4]. HIF-1α is a key regulator of cellular response to hypoxia and plays an important role in tumor growth by trans-activating various genes that are related to regulation of angiogenesis, energy metabolism, survival, resistance to anti-tumor therapy, and cell survival, apoptosis, and proliferation [7–9]. In our previous studies of OCCC and other ovarian epithelial cancers, we found an increased nuclear expression of HIF-1α in OCCC and have identified the HIF-1α regulating factors [10, 11]. Genetic polymorphisms are responsible for inter-individual variation and diversity, and have been recently considered as the main genetic elements involved in the development and progression of cancer . HIF-1α gene SNPs are more frequent in several cancers than in healthy groups [13–29]. Furthermore, they are associated with a poor prognosis in some cancers, including non-small cell lung cancer [13, 14], breast cancer [15, 16], head and neck squamous cell carcinoma , prostate cancer , bladder cancer , and glioma . A total of 35 SNPs have been located within the HIF-1α gene. Three of the 35 SNPs were located in coding regions, one in exon 2, and the others in exon 12 . The two SNPs located within exon 12 (codon 582 and 588) were associated with transcriptional activity [9, 30]. The C to T transition at nucleotide 1772 leads to an amino acid change of proline to serine at codon 582 (C1772T/P582S/rs11549465), and the G to A nucleotide substitution at point 1790 gives rise to an alanine/threonine variation at codon 588 (G1790A/A588T/rs11549467). This study was conducted to investigate the impact and susceptibility of HIF-1α gene SNPs (C1772T and G1790A) on the prognosis of OCCCs because there have been no reports to analyze the association of the SNPs with outcome. In particular, the two SNPs associated with transcriptional activity were the focus of the study because they were associated with transcriptional activity. The genotypes of the homozygous wild-type HIF-1α gene SNPs C1772T (CC) and G1790A (GG) as well as heterozygous/homozygous SNPs C1772T (CT + TT) and G1790A (GA + AA) were identified (Fig. 1). Among the 89 OCCC patients, 23.6 and 3.3% showed the presence of C1772T and G1790A SNPs in the HIF-1α gene, respectively. Results were compared with those for the Japanese healthy population group; prevalence of C1772T and G1790A SNPs was 9.1–11.0% and 8.2–8.7%, respectively [19, 31–33]. All clinicopathological results (age, FIGO stage, surgical residual tumor, recurrence, and death) failed to show a significant relationship with the SNPs (Table 1). In Kaplan-Meier survival curves, C1772T SNPs (CT + TT genotype) had no significant adverse effect on OS (p = 0.673, Fig. 2a) and PFS (p = 0.318, Fig. 2b). G1790A SNPs (GA + AA genotype) also had no significant adverse effect on OS (p = 0.643, Fig. 2c) and PFS (p = 0.748, Fig. 2d). Additionally, C1772T and/or G1790A SNPs (CT + TT and/or GA + AA) had no significant adverse effect on OS (p = 0.845, Fig. 2e) and PFS (p = 0.400, Fig. 2f). However, FIGO stage and surgical residual tumor had a significant adverse effect on OS (p = < 0.001; p = < 0.001, respectively) and PFS (p = < 0.001; p = < 0.001, respectively). In the univariate analysis using the Cox proportional hazard model, OS was associated with FIGO stage (hazard ratio (HR) = 15.62; 95% confidence interval (CI) = 4.949 to 49.31; p = < 0.001) and surgical residual tumor (HR = 16.13; 95% CI = 5.780 to 45.00; p = < 0.001), but not with C1772T (HR = 0.762; 95% CI, 0.215 to 2.701; p = 0.674), G1790A (HR = 1.609; 95% CI, 0.211 to 12.28; p = 0.647), C1772T and/or G1790A (HR = 0.892; 95% CI, 0.284 to 2.803; p = 0.845), and age (HR = 1.463; 95% CI, 0.529 to 4.049; p = 0.463) (Table 2). In the multivariate survival analysis, FIGO stage (HR = 7.527; 95% CI, 1.808 to 31.33; p = 0.006) and surgical residual tumor (HR = 4.030; 95% CI, 1.127 to 14.41; p = 0.032) were found to be the independent prognostic factors (Table 2). HIF-1α expression represents an important biomarker in the evaluation of ovarian carcinoma prognosis . In our study, OCCCs are characterized by a nuclear expression of HIF-1α compared to other histological types. It is believed that HIF-1α is one of the key factors closely associated with chemo-resistance or unfavorable OCCC prognosis [10, 11]. Overexpression of HIF-1α may be attributed to transcriptional and/or translational activity, nuclear transition of the protein, and its degradation. This study was conducted to assess whether there is an association of the HIF-1α gene SNPs with the prognosis and clinicopathological characteristics of OCCCs. A significant association was observed between prognosis and clinicopathological factors such as FIGO stage and surgical residual tumor. However, any variations of the SNPs were proven not to be associated with the prognosis. The previous studies of variable cancers with a focus on the relationship between HIF-1α gene SNPs and patient prognosis are summarized in Table 3 [13–29]. OCCC patients had more frequent C1772T SNPs than the healthy Japanese population [19, 31–33] and many other carcinomas. OCCC prognosis as well as colorectal cancer [21, 22], thymic malignancy , and cervical cancer [28, 29] prognoses had no association with C1772T and G1790A SNPs. However, the T allele of C1772T and A allele of G1790A are a poor or good prognostic factor in several cancers [17, 23]. The effects of HIF-1α SNPs on the prognosis with cancers are not uniform. The C1772T SNP has been reported to increase HIF-1α protein expression in some cancers [13, 15]. Twenty specimens, which were randomly selected out of the 89 OCCCs examined in this study, were subjected to immunohistochemical staining for HIF-1α. The results failed to show the associated between HIF-1α staining and presence of SNPs (data not shown). In our previous studies, OCCCs showed the highest frequency of HIF-1α, histone deacetylase (HDAC) 6, and HDAC7 compared to other ovarian epithelial cancer [10, 11, 35]. HDAC6 and HDAC7 induced not only HIF-1α transcriptional activity, but also stabilized HIF-1α protein via interaction with von Hippel Lindau and ubiquitin-independent proteasomal degradation of HIF-1α [36–38]. In OCCCs, post-translational modification may be more important for the HIF-1α expressions than upregulated transcription activity by HIF-1α gene SNPs. Our study has several limitations. The sample size used in this study was small and the survival analysis was only performed with a few events. However, when considering the low incidence of OCCC, the present study included a relatively large number of patients. Secondly, normal controls were not recruited in the present study; instead, we compared the frequencies of HIF-1α SNPs using the normal Japanese population reported in the past studies [19, 31–33]. In conclusion, HIF-1α gene SNPs were demonstrated to be less significant as a prognostic marker in OCCCs. The precise mechanism of the association between the SNPs and overexpression of protein level remains to be clarified. Patients’ electronic medical charts from the Saitama Medical University Hospital and Saitama Medical University International Medical Center during the period of 1994 to 2012 were reviewed under approval of the institutional review board (IRB) following the ethical standards of the responsible committee on human experimentation and with the revised Helsinki Declaration in 1983. A total of 89 patients with OCCC without preoperative chemotherapy, whose tumors were surgically resected and pathologically confirmed, were recruited for this study. Clinicopathological characteristics of these cases, such as age, the International Federation of Obstetrics and Gynecology (FIGO) stage, treatment methods, recurrence, death, progression free survival (PFS), and overall survival (OS) were reviewed. Samples were recruited from the formalin-fixed, paraffin embedded surgical specimens of OCCCs. DNA was extracted using the Gentra Puregene Tissue Kit (Qiagen, Germantown, MD, USA) according to the manufacturer’s instructions. Polymerase chain-reaction (PCR) was performed using the following specific primers designed for exon 12: 5′-GCTCCCTATATCCCAATGGA-3′ (forward) and 5′-CAGTGGTGGCAGTGGTAGTG-3′ (reverse). The PCR conditions applied were: 1 cycle of 95 °C for 2 min, followed by 40 cycles of 94 °C for 30 s, 60 °C for 30 s, and 1 min at 72 °C with final extension at 72 °C for 10 min. For each assay, a negative control (without DNA template) was added to monitor PCR contaminations. After confirming the integrity of the amplicons, all PCR products were further purified using ExoSAP-IT PCR Product Clean-up (Affymetrix, Santa Clara, CA, USA) for commercial sequencing. The sequencing primer was the same as the forward primer used for the PCR reaction. Biosystems 3130 Genetic Analyzer (Applied Biosystems, Foster City, CA, USA) was used for reading sequences on the chromatograms. Genetic polymorphisms and clinic pathological parameters were assessed using the Pearson chi-square test or the Fisher exact test. Univariable survival analysis was performed by the generation of Kaplan-Meier curves, and differences between the groups were assessed using the log rank statistic. Univariable and multivariable survival analyses were performed using the Cox proportional hazards model. SPSS v24.0 (SPSS Inc., Chicago, IL, USA) was applied for these all analyses. p values < 0.05 were considered significant. We thank Kouichi Kamada and Tomomi Katoh of the Department of Pathology, Saitama Medical University International Medical Center, for their elaborate technical support. We would like to thank Editage (http://www.editage.jp) for English language editing. This study was funded by Hidaka Research Projects in the Saitama Medical University (Grant numbers: 30-D-1-3) and Grants-in-Aid from the Ministry of Education, Science, Sports and Culture of Japan (Research Project Numbers: 15 K08355 and 18 K06997). HS took part in conception, design, acquisition, analysis and interpretation of data. MY took part in interpretation of data and drafting of the manuscript. MM, MM, and NO took part in conception and design of the manuscript for important intellectual content. KH, HT, and MY took part in acquisition of data. RO and OI took part in critical revision of the manuscript for important intellectual content. MY took part in conception, design, critical revision of the manuscript for important intellectual content, and supervision. All authors read and approved the final manuscript. This study was approved by the institutional review board of Saitama Medical University International Medical Center (reference number, 16–257).